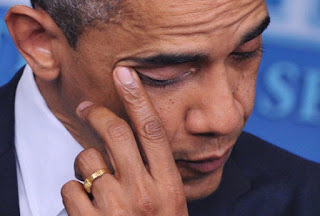 The Urban Politico: Obama: "We Can't Tolerate This Anymore" - Has America Finally Reached a Tipping Point on Gun Violence? Obama: "We Can't Tolerate This Anymore" - Has America Finally Reached a Tipping Point on Gun Violence? The weapon that you see above is the AR-15 assault rifle. You may recall that it was the weapon of choice used by James E. Holmes when he shot 58 people (killing 12 of them) at a crowded movie theater in Aurora, Colorado earlier this summer during the opening night of the third movie in the Batman trilogy, The Dark Knight Rises. It has the capacity to carry a 60-round clip or a 100-round drum in military applications; civilians are limited to purchasing 30-round clips. We now know that Adam Lanza loaded several such 30-round clips prior to embarking upon his rampage at Sandy Hook Elementary School, and we also now know that even though he took a total of 4 guns with him that day he only used this weapon, the AR-15 assault rifle, to shoot his victims. Perhaps the most horrifying yet revealing fact that we now know is this: of the 20 children and 6 teachers who were shot by Adam Lanza last Friday, every single one of them was shot multiple times. The police now tell us that each victim was shot no less than 3 times and that some individuals were even shot as many as 11 times. The scariest part about this fact is that Lanza only needed at most 10 clips (and possibly as few as 4 clips depending on the average shots per victim) to accomplish this massacre. The staff here at The Urban Politico had an in-depth discussion about this tragedy last night during our weekly radio show That's What's UP, and during that show we discussed the need and legality for 30-round clips/magazines for assault rifles like the AR-15. Our conclusion, in short, is that even the gun owners among our staff agree that 30-round clips have very little, if any, legal application within the context of our 2nd Amendment right to bear arms. Indeed, we've had this discussion before here on the blog. While it is true that we have a 2nd Amendment right to bear arms, no constitutional right is absolute. Even our most coveted freedoms of free speech, freedom to practice or not practice any religion of our choosing, and freedom of the press, which are all set forth in the 1st Amendment, are not absolute rights. Each one of them is subject to reasonable regulations by the federal, state and local governments in which we live. So, too, is the 2nd Amendment. We've spoken for many years in this country about taking real steps towards sensible and meaningful gun regulations that can help us to reduce the incidence of these types of tragedies. Usually nothing ever comes of these talks. But this tragedy seems to be different. This one has even the most ardent of gun rights activists pausing to reflect on whether something must change. It is difficult to envision so many young children being murdered for no reason, especially so close to the holidays. As President Obama said during this address to the families in Connecticut (see below) no law or set of laws will ever be able to end evil and stop senseless violence in our society, but surely we do not accept that as an excuse to take no action whatsoever towards preventing what happened last Friday from occurring again. Surely we can all agree that you have a right to own a gun to protect your home or to use in recreational hunting, but that your right to own that gun does not require you to also have a 30-round clip of ammunition. I submit that in order to make a change on this subject we start with the baseline premise that what happened on Friday is unacceptable, and whatever we can do to prevent it from ever happening again is what we must do. To be clear, there are many facets to this issue that must be addressed such as (i) mental health issues, (ii) a gun violence culture, and (iii) increased enforcement of background checks, etc. However, eliminating 30-roung magazines for semi-automatic weapons that have repeatedly been used in our nation's deadliest shootings should be an easy first step.